Panacur Rabbit Paste has been produced to control parasites such as intestinal worms as well as the potentially serious pathogen E.cuniculi in domestic rabbits. 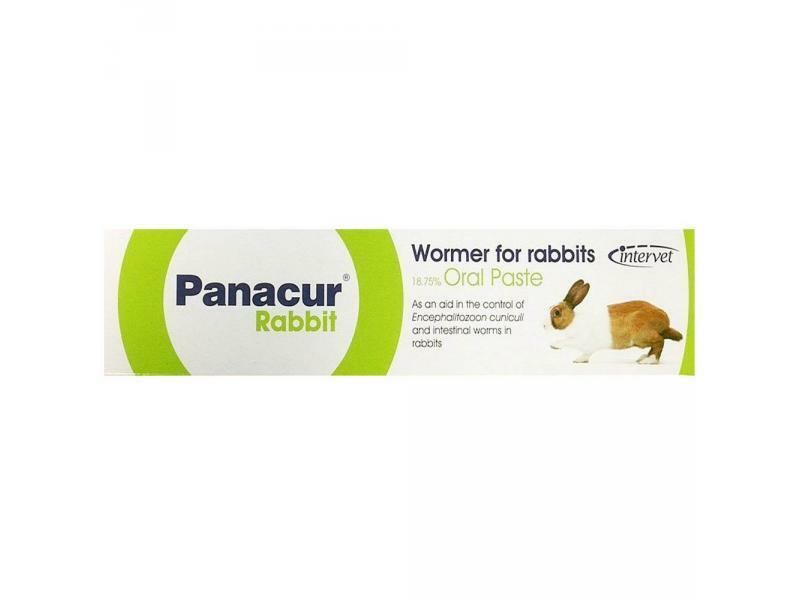 Panacur Rabbit has a pleasant flavour for rabbits and can easily be syringed slowly into the side of the mouth. Each syringe contains enough paste for one dose per day for 9 days (suitable for routine treatment of intestinal worms). E.cuniculi is a microscopic parasite which infects many rabbits without causing any signs of illness or disease at all, remaining dormant for years. However in some individuals, especially after a stressful event, it can suddenly and catastrophically cause serious disease. This often affects the rabbits balance and posture, producing a marked head-tilt and a tendency to fall to one side, or hind-limb paralysis. For rabbits showing clinical signs of E.cuniculi, a 28 day course of Panacur ir recommended. See below for dosage information. A 9 day course of treatment for intestinal worms when a new rabbit is purchased is recommended. This can be repeated 2-4 times per year where rabbits are kept in groups. Each syringe contains 5 g of18.75% fenbendazole paste. For oral anthelmintic treatment of domestic rabbits use: 1 syringe graduation per 2.5 kg bodyweight (20 mg/kg fenbendazole) daily for 9 consecutive days. Consult your vet for further information or if you are concerned about protozoal infection (E.cuniculi). Syringes containing 5 g of an 18.75% oral paste formulation of fenbendazole as a ready to administer oral anthelmintic and anti-protozoal for domestic rabbits. 1 g contains 0.187 g active ingredient fenbendazole. A broad spectrum anthelmintic as an aid in the control and treatment of Encephalitozoon cuniculi (E.cuniculi) and intestinal worms in domestic rabbits. Panacur Rabbit should be administered orally by squeezing the paste from the syringe into the side of the mouth. Administer 1 syringe graduation per 2.5 kg bodyweight (20 mg/kg fenbendazole) daily for 9 consecutive days. Routine dosing of rabbits is recommended 2-4 times yearly. Dosing should also be considered during periods of higher risk, such as when the rabbit is acquired, prior to mating and when mixing with other rabbits. (1 syringe graduation per 2.5 kg bodyweight) daily for 28 days is recommended. For single treatment course only. Direct contact with the skin should be kept to a minimum. Wash hands after use. Do not store above 25oC. Dispose of empty packaging and any remaining product in the household refuse. 5 g syringes and packs of 10 x 5 g syringes. A 2006 UK study showed a seroprevalence of 52% in domestic rabbits indicating the widespread nature of the parasite. Panacur Rabbit is an aid in the control of E. cuniculi and it is recommended that additional preventative measures are taken such as ensuring that food and water are placed appropriately to prevent urine contamination. Below are some recent questions we've received regarding Panacur Rabbit Paste, including answers from our team. I have 2 rabbits how many syringes will I need to effectively treat them both? This depends on the weight of your rabbits. One syringe will provide a full 9 day course for one rabbit of up to 5kg bodyweight. If your rabbits are smaller and weigh 2.5kg or less, then one syringe will do a nine-day course for both of them. Most rabbits are in the range 2.5kg to 5kg and so need one syringe each, but some can be heavier than this and need proportionately more. You do need to weigh your rabbits first, even if it just an approximate weight. My Guinea Pig weighs 475g how many of these syringes do I need for a preventative regime? Most guinea pigs do not suffer from intestinal parasites in any significant way at all.There is no need or point in giving medication prophylactically like this. As long as you concentrate on providing good quality food including fresh greens/grass and a clean environment, your guinea pig should do perfectly well.